Help Sales Executives to better drive the sales operation top-down. In my view and based on working with Sales Managers since the early ’90’s, the most pervasive problem confronting Sales People is not properly qualifying their buyers during sales calls. In fact, because this problem tends to be so widespread, it is likely the most underestimated yet critical challenges confronting Sales Management. When Sellers don’t qualify or mis-qualify their buyers during a sales call, the result normally is that they conduct opportunities with buyers who are too low in the buyer organization. This has a significantly negative impact on the opportunity, the Seller, and the sales organization. It results in not getting to the real buyers (as a VP of Sales once said to me, “They are an amorphous cloud”), elongated sell cycles, a significant waste of time, a low probability of a win, and inaccurate pipelines and forecasts. It can be encapsulated with the term, “Calling Below the Power Line” and measured accurately with a straightforward metric, which we call the “A/B Ratio”. Often times shield sellers from the true buyers who are above the power line, or, as a VP of Sales once describe it, making the real buyers “an amorphous cloud”. May favor the competition or view the seller as their competition and purposely shield the true buyers from the seller. We call an opportunity where the seller has gained access to buyers above the power line an “A” opportunity. We call an opportunity where the seller is below the power line a “B” opportunity. And, therefore, the key performance metric is, simply, the “A/B Ratio”. 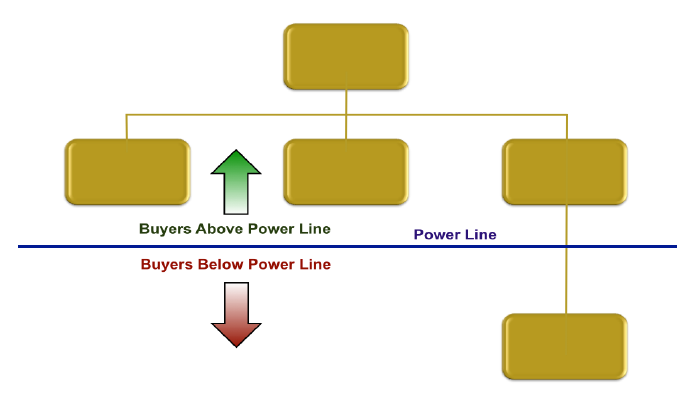 It measures an individual seller’s ability to qualify buyers by gaining access to power. Importantly, as you move up the chain of command, it becomes the key metric to measure the effectiveness of an entire sales operation, from sellers, through managers and right up to the VP of Sales. The processes that Sales People and Managers should follow to achieve Best in Class.